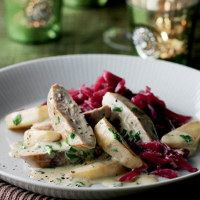 Sweet apple and tangy crème fraîche combine to make a tasty sauce to complement the subtle gaminess of pheasant breast. Put the oil in a small heavy-based frying pan over a high heat. Season the pheasant breasts well and place in the pan. Cook for 2-3 minutes on each side or until just cooked through and nicely browned. Set aside on a plate to rest for 5 minutes, covering with foil to keep warm. Meanwhile, place the apple wedges in the pan and cook for 1 minute on each side or until golden brown. Add the chicken stock and cook for 5 minutes or until the sauce reduces by about two thirds and the apple is tender. Turn the heat right down then stir in the crème fraîche and parsley. Season to taste. Cut the pheasant breasts into 4 or five diagonal slices and return to the pan, with any juices, to warm through. Serve with ready-prepared Waitrose Red Cabbage, or Cavolo Nero cabbage lightly steamed until tender. Add a splash of cider or Calvados to the sauce for a more complex flavour. Try a lovely soft Merlot blend with supple fruit and oak tannins.